When summer gives up its bounty of fresh fruit, preserve that sun-kissed flavor in good-quality brandy (for the best results) to be enjoyed year-round on ice cream, pound cake, pancakes, or as is with ​whipped cream. A single type of fruit can be used, say peaches only or pears only, or a combination of fruits and berries. Berries should be left whole but larger fruits will need to be pitted and diced and, in the cases of nectarines, peaches, and pears, blanched and peeled. 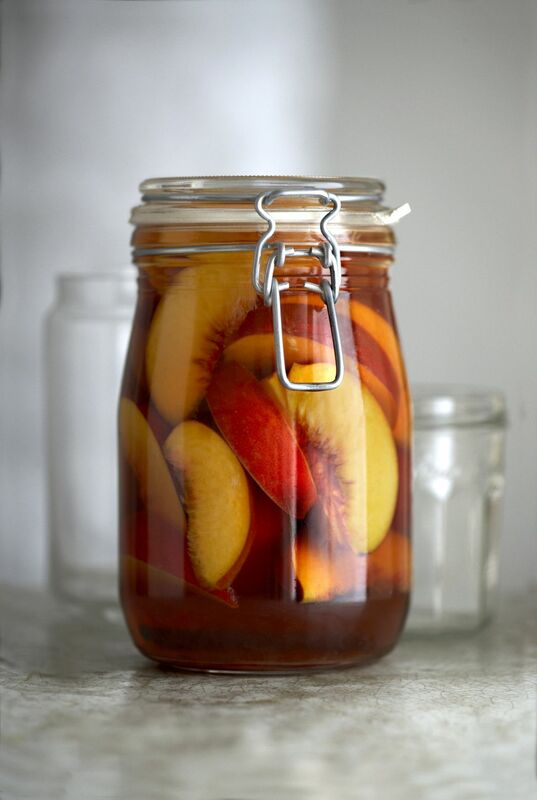 One of the ways in which fruits can be preserved is in alcohol—no water-bath processing required—without fear of botulism and that is how they are "put up" in this recipe. Brandied fruit makes an excellent item for an edible gift basket. But it takes at least one month for the fruit to be at its inebriated best (longer is better), so keep that in mind when making this recipe for gift-giving. Start in July for Christmas! In a very large bowl, combine fruit and sugars, tossing well. Cover and let macerate for 1 hour, tossing every 15 minutes. Divide fruit among 8 sterilized pint jars or a gallon covered crock. Pour in the brandy, making sure fruit is submerged. Cover and store in a cool place for at least one month. Since the brandied fruit will only improve with age, let the flavors develop for more than one month. Once aged, store the brandied fruit on a counter. As its contents diminish, just add more diced fruit (2 cups fruit to 1/2 cup each white and firmly packed brown sugar) and brandy to cover. A compote, on the other hand, can be made with fresh, canned, or dried fruit that is cooked in a sugar syrup along with spices, other flavorings, and sometimes includes wine, brandy, rum, or liqueur. It is not aged but stored in the refrigerator and meant to be consumed within a short time. As mentioned, brandied fruits are delicious on ice cream, pound cake, pancakes, or as is with a little whipped cream, but you can turn them into so much more. Drain 1 cup of fruits, reserving the liquid, and bake them into a cake mix or cake from scratch, substituting any liquid called for in the recipe with the brandied fruit syrup (the alcohol will burn off). Add some to mixed drinks, punch, sangria, or in a nonalcoholic beverage made with sparkling water. Use well-drained fruit as the crowning glory in the middle of a frosted cake. Use as a condiment alongside turkey or other roasts by cooking down the liquid only until thick, and recombining with the fruit. Mix well-drained and chopped fruit with softened cream cheese for an interesting cracker-and-cheese plate.